Bending rebar with the proper techniques is an important part of making sure your rebar structural base is done correctly. If rebar is bent or cut improperly the safety of your construction site is at risk, leaving your structure unreliably reinforced. As a construction professional you want the safety of your project to be number one, you don’t want anything to break after your job is completed. Which is why it’s important not only to make sure you use proper rebar bending tools but that they’re properly operated. 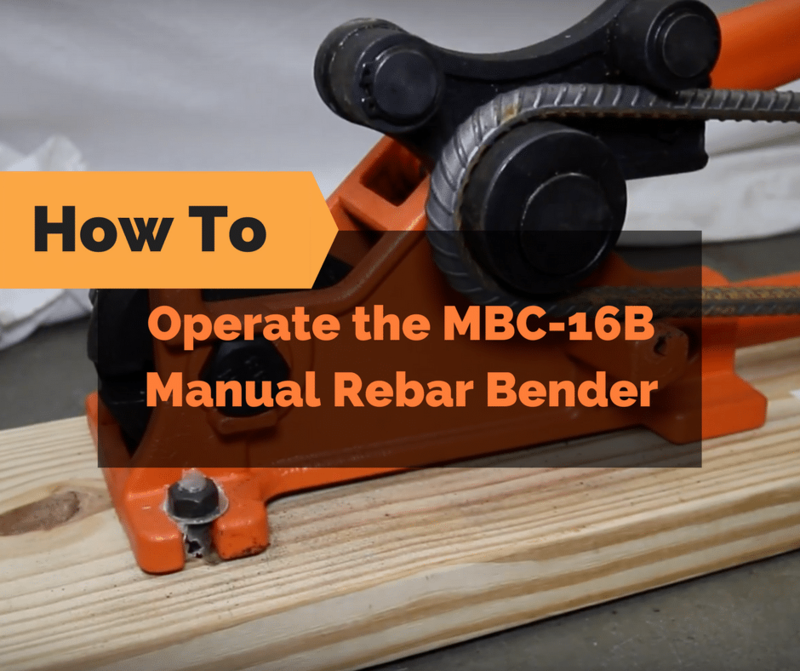 In this blog, we will walk you through how to properly operate the MBC-16B Manual Rebar Bender so that you can complete your next job perfectly. First, you’ll want to make sure you select the correct cam setting for the rebar you wish to bend. Simply pull the cam toward you and rotate to the desired setting. This setting 10 means 10 millimeters or number three 3/8″ bar, 13 is for 13 millimeters or number four 1/2″ bar, and 16 is for 16 millimeters or number five 5/8″ bar. Once you’ve selected the proper cam setting, simply put the rebar in place and apply pressure until your 90 or 180 degrees desired bend is completed. 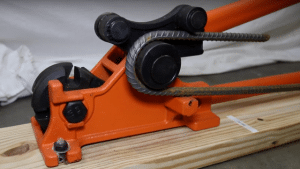 Next you’ll want to work on cutting rebar. 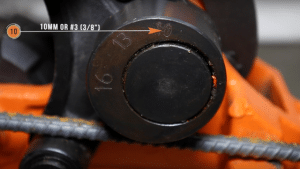 At the front of the tool there are two slots, a top position is for cutting number five and number four rebar, where the lower slot is for number three. And note the maximum cutting and bending capacity of this tool is grade 60 rebar. Before cutting the rebar be sure you have the right cutting slot selected, there should be just a small amount of play in the jaws. For example, as you’ll see here this piece of number three rebar is much too small for the number five slot. This number five bar as you can see fits just right, with a small amount of play. 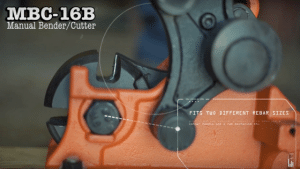 Once you have the correct cutting slot selected proceed by applying pressure until the cut is completed. In step four we show how to obtain a 180-degree bend. Start by placing a straight bar on the lower roller and bend 90 degrees. Once your rebar has a 90-degree bend, place the vertical part against the top roller and complete the process. 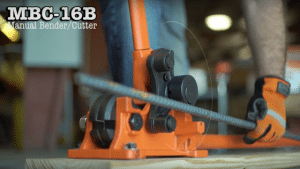 Well, that’s how to properly operate the BN products MBC-16B manual rebar bender and cutter. If you have any further questions please feel free to contact us!